I’ve been itching for an adventure lately, so early this morning I hiked up Mt. Sneffels in the moonlight again! I left Ouray at 1:30am (ouch!) and started hiking into Yankee Boy Basin at 2:30am. The “supermoon” – aka, the full moon at its closest orbit to Earth – was incredibly bright, and I had no troubles finding my way without headlamp. 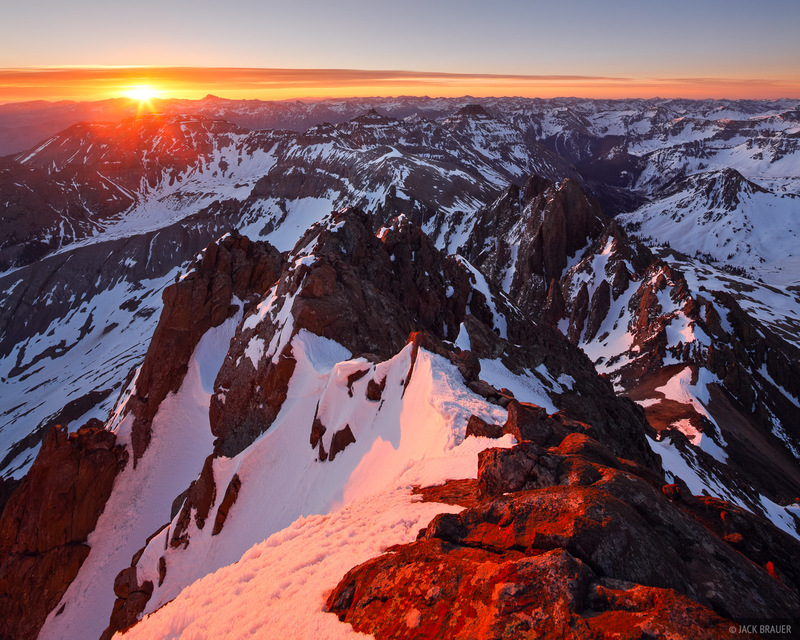 I arrived at the summit at about 5:15am, just as the first orange and blue light of dawn illuminated the eastern horizon. 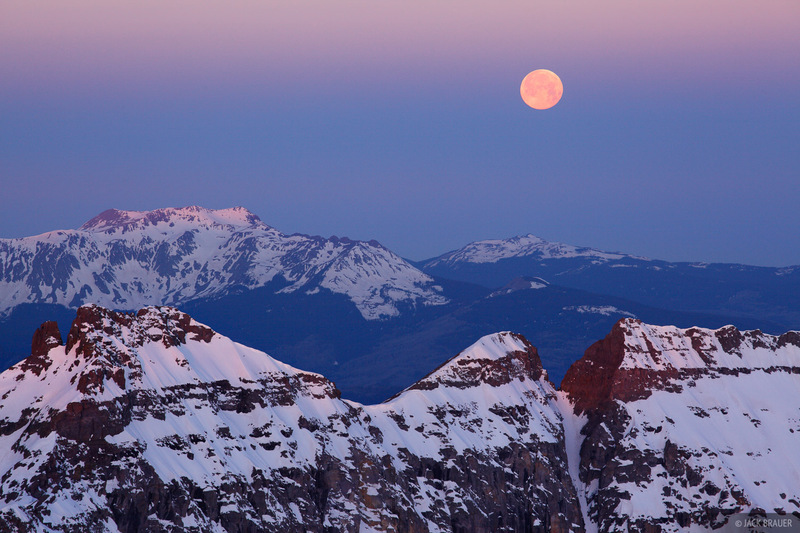 Moonset over Dallas Peak, as seen from the summit of Mt. Sneffels - May. This was the second time I’ve ascended Mt. Sneffels in the moonlight; you can see photos from the first time here. There’s something so special about being up high at night, especially when you can see clearly in the moonlight! The sunrise was awesome, but so was the moonset – I had a hard time choosing which direction to shoot! 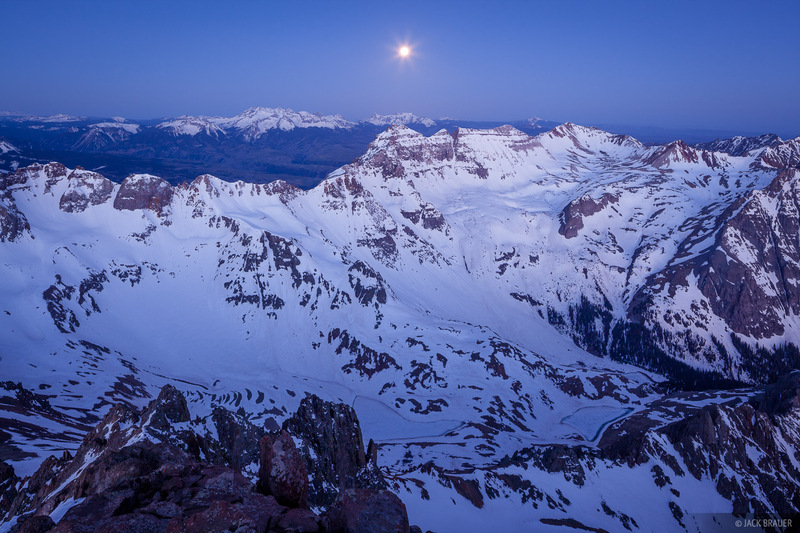 A "supermoon" - aka the full moon at its closest orbit to Earth - sets behind the Dallas Peak (close) and the San Miguel Range, as seen from the summit of Mt. Sneffels. Sunrise atop Mt. Sneffels (14,150 ft.) - May. Me, chilling out by myself on the summit of Mt. Sneffels. 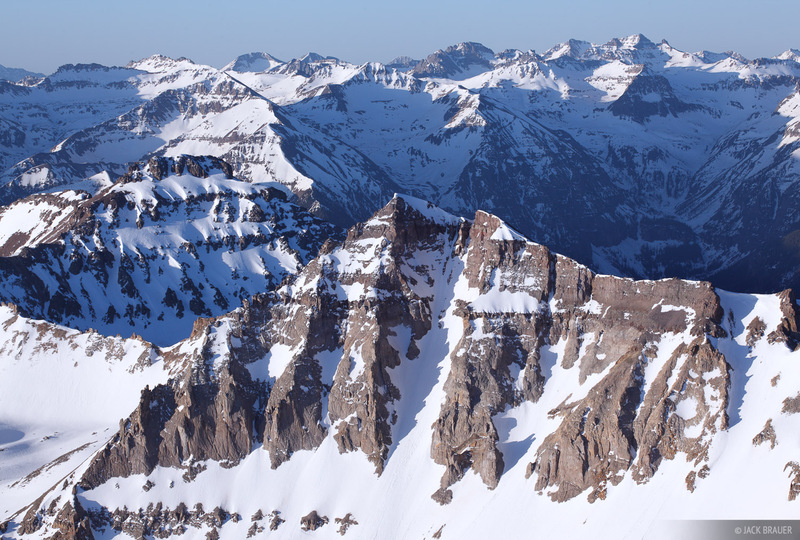 Here’s a view of neighboring Gilpin Peak (13,694 ft) seen from the summit of Sneffels. 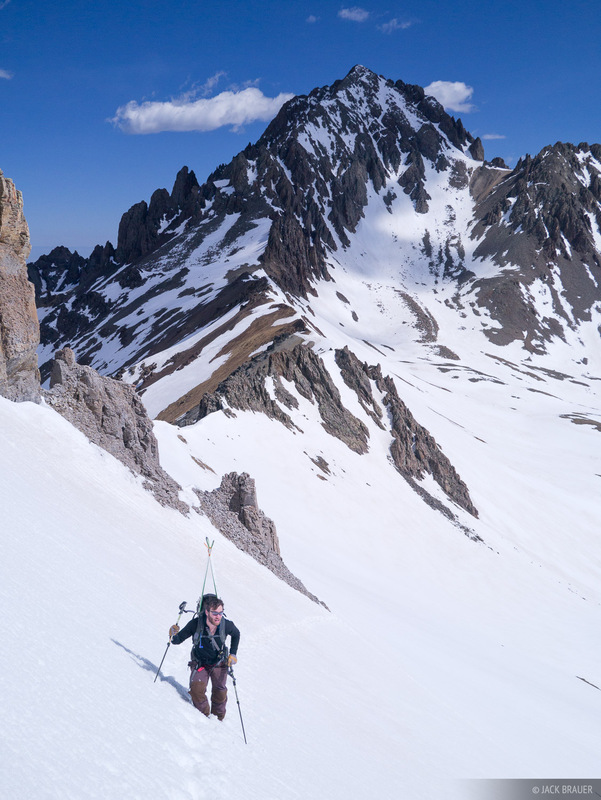 Because I knew I’d be descending Sneffels when the snow was still frozen, plus the fact that the dearth of snow on the south side of Sneffels made it virtually unskiable, I had stashed my splitboard at the base of the Lavendar Col and hiked back down in my crampons. But I wasn’t done yet! 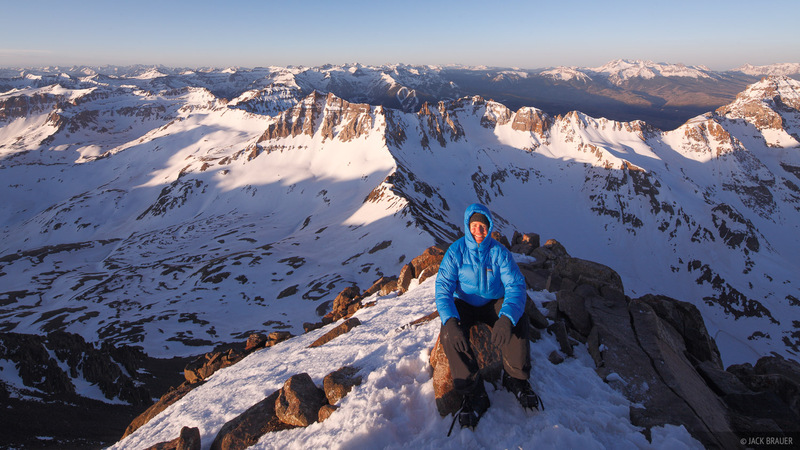 I had plans to meet Jake from Vermont in the flats between Sneffels and Gilpin. We rendezvoused at 9:00am and started hiking up Gilpin. Our destination was the couloir on the far right side of the photo above (the more dramatic center couloir was full of bumpy snow). The snow was getting alarmingly soft and wet, so we pulled the plug about 2/3 of the way up. 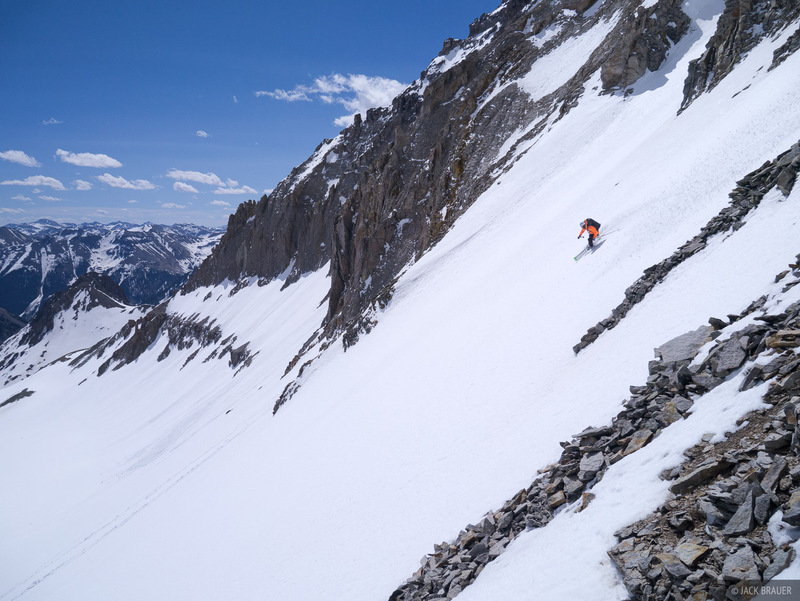 Jake Evans skiing down Gilpin Peak in the Sneffels Range - May. Posted in Colorado, Skiing & Snowboarding and tagged Colorado, San Juan Mountains, 14ers.